A well-written memoir is often the golden key to understanding the mind and idiosyncrasies of a public figure, especially one who has been observable for decades now. Karan Thapar, is one of my favourite interviewers, and for good measure. An ideal interviewer must be able to engage the interviewee enough to elicit a response that contributes to the central idea that the question sought to address. With his soft yet stern questioning, which more often than not is backed by concrete facts, and deeply logical assumptions and theories, Karan has managed to strike the perfect balance that this niche skill requires. The Devil’s Advocateoffers a unique insight into how this balance developed, and interestingly also comments on the development of India’s polity in the effable yet subtle style that is sui generis to Karan. The book is peppered with anecdotes and incidents from Karan’s life which are so visibly reflected in his approach towards journalism today. For instance, he writes about one of his first bosses at in the television broadcasting field, John Birt, and the basic tenets of interviewing that John taught him, which are evident in his manner to this date. A couple of weeks ago, Karan interviewed Nitin Gadkari, and it is pleasing and yet astonishing to see Karan follow the same pattern of interviewing that he first learnt back in the 1970s. Gently, Karan also chose to drop in sly comments that reflect on the scenario of India’s politics today. The line (mentioned in context of the timing of when Indian politicians choose to give interviews), “When in trouble, they become invisible” spoke volumes beyond the context he mentioned it in, which in beautiful fashion builds slowly throughout the book and weaves into a broader commentary on the congeniality that underlies the world of journalism, policy, diplomacy and politics that he transverses through. Another beautiful issue the book brings out is the jovial and almost familial manner in which Indian politicians function, across the spectrum. In more ways than not, these stories are a prophetic warning to the increasingly divisive form of politics that are practised in our country, and perhaps a sounding board to many. The book, I believe, goes beyond being a narration, and could possibly have been an exercise in self-reflection. He speaks about his equations with popular personalities, and in typical fashion, builds their principled stances, points out their hypocrisy or the non-reflective nature of their actions, and goes on to question them on the same. Albeit the people concerned are proffered no opportunity to reply, that burden in itself, is an unfair one. An average reader unaware of Karan’s profession, notwithstanding the numerous references in the book, will have no trouble believing that the book came from the mind of an inquisitive journalist. It is always interesting to trace the foundations of a strong poplar to its roots, and the biases of a self-narrative reflection aside, this memoir lives up to its expectations, offers vivid tales that assign new traits to revaluate some of the important personalities in our subcontinent, and makes for a light yet invigorating read. I have felt this incessant need to take away something or the other from every macro action I can imagine in life. Play a game, take something from it, apply it to “better” life. The idea of self-enrichment appeals a lot to me, and is something that constantly drives me. That’s why days that are just…insignificant, bother me. Well, bother won’t be the correct term, but rather leave me queasy. Uncomfortable maybe. Takes away a particular sense of purpose. But it is in times like these that I like to remind myself that it is unfair to judge a day in isolation, because that’s not who we are, and that’s not what life is. We are products of our life experiences, and each one of them counts just as much as the other. We’ll always be way too close to the picture to see the actual, larger image, and by the time we do, it would be too late to go back in time and fix the incorrigible treatment our so-called insignificant actions got. Perhaps a better way to look at it is to assign notional value to things until you can actually assign it one. But isn’t that a way of beating the system, and treating just the symptom and not the cause? Thoughts on this? I have recently begun another rerun of my favourite television show, How I Met Your Mother. That show is the reason why I am, who I am. Sometimes I think I am outgrowing it, and that’s when I watch an episode, smile and realise that I never will. Regardless, one of the episodes (Season 1, Episode 2) is titled the Purple Giraffe and deals with a situation where Ted is trying to woo Robin, and the title is a metaphor from a situation that happens on the episode wherein a kid who is playing on a claw-crane, and on being unable to win a desired Purple Giraffe, the kid climbs in through the vent of the machine to get it. Isn’t that what all of us are looking for in life? The Purple Giraffe? I don’t necessarily mean this in the romantic sense. Sure, that too, but isn’t that what we want? Inspiration, professional or personal, that drives us to absolutely insane limits to achieve it. Personally, I believe all of us have some purpose in life. It doesn’t mean we have a purpose, but just some purpose that drives us. It can’t be singular, because honestly, we are not the same person at any given instant. We are evolving creatures, who adapt, absorb and evolve, particularly using the world around us. In this transitionary human life, it is definitely possible to have multiple goals or purposes, but I think it is a simply human instinct to work towards one. The argument I want to press forward is that given this melee of thoughts and emotions everyone experiences, it is enthralling when you discover your current purpose, as the satisfaction that fills you when you achieve it, or even are able to work towards it, is in itself, what life is really about. So as part of my resolutions for 2018, I have decided that I shall be writing something everyday, a minimum of 200 words. I’ve become quite lazy when it comes to writing in the past few years, and I figured this would kick me into action. I think that’s enough of an introduction, and I’ll jump directly to what I wanted to write. I have been experiencing a very strange feeling ever since 2018 kicked in. Have you ever felt that you’re in love with being in love, without being in love with someone. Perhaps that’s what craving for companionship means. To be honest, I don’t even know what this is. It definitely is not lust, not in its entirety. It’s not me falling for someone, and experiencing a bloom of feelings. It’s just…me having feelings of a romantic kind, towards someone. Now who that person is, I don’t know, I genuinely don’t. What bothers me is that I don’t know what to make of this. Should I be proud? Proud of the fact that I can successfully experience a surge of positive emotions without necessarily aiming them towards a particular person? Should I be sad and miserable about the fact that I literally do not have a romantic interest to share this with? Should I be terrified of the person I’m becoming? After all, it is a dangerous ability this, to experience love at one’s desire and choosing, one with tremendous potential for misuse, and with an almost insatiable ability to cause emotional hurt to oneself, and others. As I end this, I would like to believe that there is someone out there, who is feeling exactly this, and is obsessing over what she’s going through. That thought brings a broad smile to my face. Beat by beat I fall, thoughts collapse. Before you trash this article as propaganda, let me make it very clear. This is simply an article trying to openly address the question that we, as a nation, and more importantly, as a race, as a species, as a civilization, need to answer. Can we justify and, to that extent, actually kill another human being? I’m probably an abolitionist, although I confess I do not have any material research to back my opinion herein. Simply certain musings and thoughts from my mind. The death penalty (also called capital punishment) is punishing a criminal for an offence by inflicting death. It has existed for ages, yet as of today, it has been abolished in 139 countries across the globe. The methods maybe different and include, but are not limited to, hanging from a noose, shooting, administering death inducing drugs, stoning, and passing electric current through the body. To ease my mind of my problem with the death penalty, and with regard to this entire process, I decided to write this article, working on an assumption that death penalty is a valid penalty and should be administered. I figured if I can poke enough holes in the very idea of the penalty, I will be able to conclusively answer the question. How different are we from X if we kill X? X killed the person for a reason. He had a reason for it, which he deemed enough to warrant killing. He was punished for it, with capital punishment. We killed X for a reason. We deemed it enough to warrant killing. But we won’t be punished for it as we have the authority vested by society in us. Now, let’s examine something. Does society have the power or authority to legitimise killing? Every other incident that society regulates, either through morality, religion, governments, legal systems or any other route is an instance of regulating constructs that are human-made. Life is not a human creation. I don’t mean the act of creating life, but the prolonged idea of life itself. I don’t care if you believe in evolution or the divine theory, but the fact remains that we cannot create it (again, I emphasise, that life in this particular context is not just the creation of a biological being in the literal sense, but the entire process i.e. the experience of life, participation and interaction in the environment around a person etc.) or restore it or duplicate it. We simply cannot. We take away someone’s freedom; we can restore it. We take away someone’s life; restoration is not even a possibility. The action is permanent. If X is given the capital punishment, X shall cease to exist, and can never be brought back. Now this where the common argument comes in, “if he was heinous enough to do it, then he deserves it.” “He didn’t think about the person/people he killed, ergo he deserves to die”. This is where the idea of capital punishment develops internal inconsistencies and logical fallacies. So the assumption of validity rests on the idea that we as a society, are punishing an individual from deviating from a set of ideals laid down already. For the sake of argument, I am assuming these ideals are set in stone to ensure a utopian society that is again, fair, equal and just. But giving into the argument mentioned here means deviating from the ideals of society and adopting the ideals taken by X him/herself. Confused? Let me simplify. X kills 100 people by bombing an apartment building. Our reason for inflicting the capital punishment on him/her is that he/she didn’t care about them, so we shouldn’t care about him/her either. Well, if X is getting the capital punishment for killing people without caring about them, shouldn’t we be getting the capital punishment as well for killing X without caring about her/him? What puts us up on the moral pedestal that protects us? If the answer lies behind the fabric of legal and social sanction, we effectively create a major issue. Let’s address the problem behind claiming a socio-legal backing i.e. an argument rooted in majoritarianism. I shall address majoritarianism later in this piece as well, but in this context, the risk it poses is of us being non-uniform in our justice system as reformative legislations or provisions, or pushing for changes to ensure effectively address the question of equality and discrimination, lose steam by accepting this argument as most of them do not have societal backing, in terms of number. This argument has one flaw. It places the right to life as a fundamental right at par with other fundamental rights. The right to life is one which is not granted by society but which an individual possesses by virtue of his/her birth. The right to equality is a relational right i.e. it exists in a society, in conjunction with others. The same goes for other basic fundamental rights such as the right to freedom etc. The right to life is an absolute right which one possesses in isolation from everyone, and even in conjunction. The part that is in conjunction with others, deals more with the quality of one’s life, and its nature, while the absolute right is simply a guarantee of not being killed. It is not granted to someone simply because they are a member of a society or citizen of a country, but by the mere fact that you are born as a member of the species homo sapiens. Something that I have not addressed here is the element of guilt: whether or not an accused is guilty of the offence. That is because this entire argument is based on the idea that there is no offence that warrants the death penalty, hence there is no element of guilt involved. In fact the idea of defining certain offences as ‘worth awarding the capital punishment’ introduces elements of being perfectly assured and completely sure of an accused’s guilt, which is an unachievable goal. The idea is to separate the concepts of guilt determination and sentencing. At the outset, the idea is to ensure reasonable punishment. No one is denying the guilt of a prisoner who has been convicted after due process. However, that element has to be separated from the sentencing of the convict. Another obstacle I encounter is being confronted with whether someone from my family has been subject to a crime that warranted the death penalty, and would I argue for non-imposition of the death penalty for the accused then? Here’s the deal. Call me naïve if you want, but the very fact that we have a mind capable of understanding logic and reasoning is what makes us human beings. I know it is idealistic to say this, but there have been many situations when people have shown true humanity by arguing for non-imposition of the death penalty for those accused of committing heinous crimes against their loved ones. Again, here the idea is to ensure reasonable punishment. The argument is in favour of the maximum possible punishment, say life imprisonment, but mine, or anyone else’s conviction against the death penalty arises from rationality and logic, hence anger and rage are not factors that should be playing a role in changing it. What I am trying to say can possibly be summed up like this – Taking life, under no circumstances, including State-sanctioned ones, can ever be legitimate. I realise this article in itself is subject to criticism and probably has multiple flaws, or leaps, in logic. But the very purpose of this article is to express an opinion, maybe an ill-informed one at that, but an opinion nevertheless, because when it boils down to the life of a person, every last bit counts. NOTE: This piece was written by me for the 10th issue of Audi Alteram Partem, NLU Delhi’s college magazine. Journalism has a penchant for narratives, which are mainstream, and rarely steps into the realm that addresses the other side of the debate. However, Barkha Dutt is one of the handful few journalists who has often transcended the border between the two sides, and has given mainstream reportage a depth it unfortunately lacked. 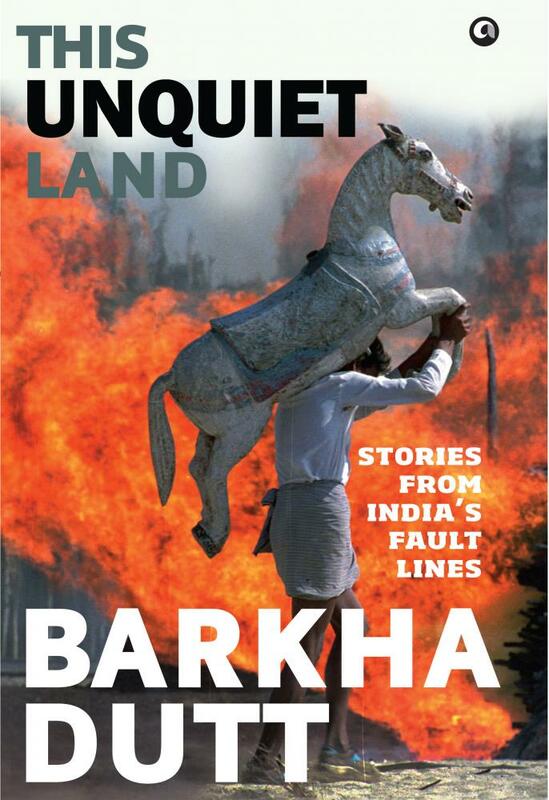 This Unquiet Land, is essentially a reflection in retrospect by Barkha Dutt, on the ground reality she experienced in her nearly 25 year long career, while at the same time, providing critical commentary on the fractures that have put India in a cast. Primarily an on-air journalist (of course, with the occasional columns in prominent newspapers), this is Barkha’s first book, and this fact is bluntly obvious. Despite having a flair for words, the narration, or rather the flow of the book is scattered, and open-ended. Several important issues are raised, discussed, dissected and analysed by her, but cumulatively, the book fails to make a point except for a reiteration of the status quo i.e. the dark yet colourful paradox that is India. That being said, the content of the book is riveting. Narration of horrifying events that actually occurred, without resorting to dramatization, while simultaneously breaking the walls of privilege built around the reader to expose her to the horrors faced by people, is extremely difficult and Barkha does an excellent job of the same. Covering a wide spectrum of issues that the country was confronted with, she does a stellar job hitting the right nerves at every required instance. One of the major stimulating factors, is of course the fact that she is one of the first on-ground female reporter India saw in the post-liberalization era, and that in itself provides for an unique read. At multiple instances, the book talks about unique anecdotes and incidents from Barkha’s life as a reporter, and how the same influenced her, changed her or forced her to think beyond the theoretical jargon one graduates with. To be fair, the book also acts as Barkha’s venting zone, as she tried to subtly include replies to certain allegations against her as a part of India’s narrative on major issues, but the subtlety was lost in the harsh barrage of words against her detractors. At this point, I must express my personal displeasure at the same. Not due to the content, but due to the simple fact, that those rants lacked context. A book claiming to explore India’s fractured lines has no context for replying to accusations and allegations which are personal to the author. Overall, I must say that I was disappointed. Not because the book was disappointing. In sum, the book is average at best, but perhaps I had come to expect more from one of the better journalists in the country, who has often also written scathing columns along the same subject matter the book revolved around. This is not a book that you have to read, but it definitely is one that you should read for a rude shock about what India really is, along its shaky faulty lines.